Are you ready? As of September 1, all hazardous products sold or imported into Canada and intended for storage, handling or use in a Canadian workplace must be compliant with WHMIS 2015. 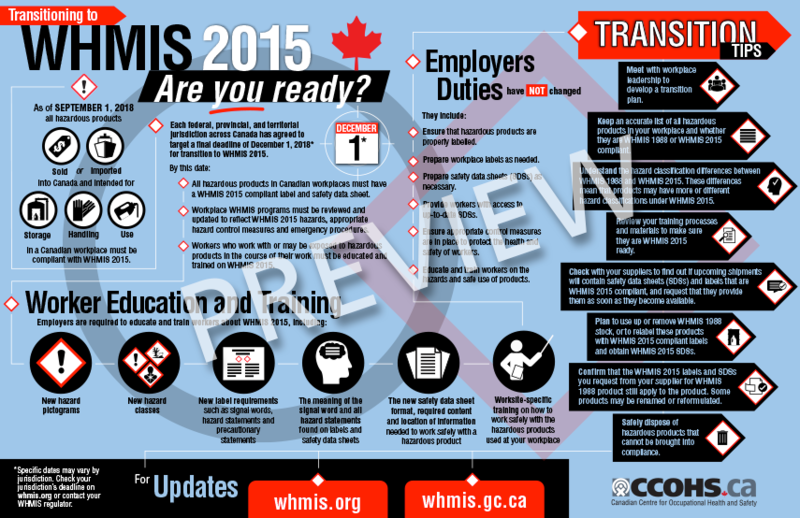 Each federal, provincial, and territorial jurisdiction has agreed to target a final deadline of December 1 for transition to WHMIS 2015. This infographic outlines your responsibilities and duties as an employer, including worker education and training, and tips to help you make the transition to the new system. Note that specific dates may vary by jurisdiction. Check your jurisdiction’s deadline on WHMIS.org or by contacting your WHMIS regulator.